Moose are the world’s biggest deer now in existence. In Europe, a moose is called an elk, while in other places the moose is called a camel deer. 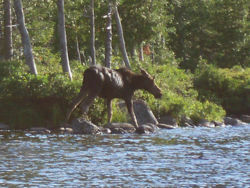 The moose’s habitat is Canada, America, Sweden, Norway, and Siberia. They came into existence by the Hand of God on Day 6 of Creation. The moose's body is bigger than that of the horse; they are 2.5 to 3 meters long (8 to ten feet), they can weigh 800kg or 1750 pounds, and they usually live 20 years. The moose’s body is very strong and their back legs are unimaginably strong. The moose’s fur color is usually dark brown, but in winter their fur color can change to gray for protection. The main difference between normal deer and the moose is their antler. The male moose has a flat antler ending in pointed tips like a hand with fingers. The antler reaches 1.5m (5 feet) in length and its color is usually brown and red. The moose has a blood stream which feeds its antler, so in China, a moose antler is used along with Chinese herbal medicine. This page was last modified on 23 July 2014, at 19:41.